The match was played in National Football Center, Sofia, Bulgaria and Turkey's goals came from Atalay Yıldırım (Min. 4), Atakan Gündüz (Min. 17), Mustafa Kaya (Min. 58) and Emir Biberoğlu (Min. 65 and 67) while Stanislav Shopov (Min. 52) and Martin Minchev (Min. 72) hit the target for Bulgaria. 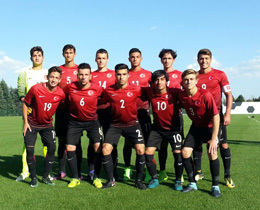 Turkish U17 National Team will face Bulgaria again on 21 September 2017 Thursday in an another friendly game. Turkish U17 National Team, consist of from the players who born in 2001 and coached by Ahmet Ceyhan will participate in 2017-18 UEFA U17 European Championship Qualification Round which will be played in Czech Republic between 13-19 October 2017.